Welcome to Seed & Feed Marching Abominable! The S&FMA is always welcoming musicians and dancers for all sections of the band. There are no auditions, and no marching experience is required. We have musicians from 16 to 85, from beginners to professionals, and from all walks of life! Most of the musicians in the band had not played their instruments for many years when they joined the band, so don’t feel like it’s been too long to get started again. It is probably a good idea that you know how to read music (don’t worry…you’ll be surprised at how fast it comes back to you). You do not need any previous marching experience; we wander more than we march! The Band is in season between Labor Day and Memorial Day each year. 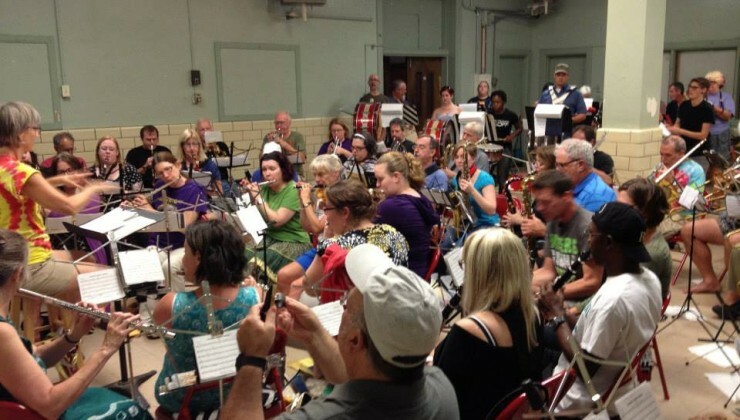 We practice on Tuesday evenings at 8pm at the Little Five Points Community Center. Our first rehearsal of the 2017-2018 Season will take place on August 29th at 8 pm. Please join us! If you would like more information about how to join Seed & Feed or what to expect, please fill out the form below and our friendly neighborhood Rostermeister (Membership Coordinator) will get back to you soon. We can’t wait to see you at the band room! Little Five Points Community Center is on the corner of Euclid and Austin Avenues. From 75/85, exit Freedom Parkway. Follow Freedom Parkway (bear right at both forks in the road) until it dead ends into Moreland. Take a right onto Moreland and go to the third traffic light. Turn right at this light onto Euclid. Just past the second light on Euclid, turn left into the Community Center parking lot. We practice in the front room. Please don’t park on the grass. There is additional parking along the right side of the building. For more information, email rostermeister@seedandfeed.org.